Fashion Designers' Council of the Philippines (FDCP) president and former Celebrity Duets contender JC Buendia announced on Monday, September 19, the 19 finalists of Weaving The Future—a social design competition for young designers that aims to empower local communities by infusing indigenous crafts into wearable art. 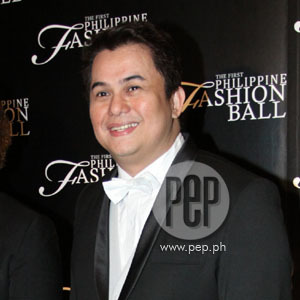 Designers such as JC Buendia, Randy Ortiz and Avel Bacudio of the Fashion Designers' Council of the Philippines (FDCP) have been responsible for making top celebrities like Kris Aquino, Lucy Torres-Gomez, Richard Gomez and Diether Ocampo, among others, look their best with the help of their fabulous creations. This time around, these top celebrity designers and other big names in the fashion industry are sharing their talent and know-how to newbie designers through a social design competition entitled Weaving The Future. Launched in June 2011, the competition aims to provide sustainable livelihood for regional communities while some of the country's top designers mentor the contestants as they bring life to their sketches. "We have selected fashion designers after giving them the challenge of making wearable creations out of indigenous materials like piña, jusi and other organic Filipino fabrics. "We'd like to promote the use of these Filipino raw materials which are being produced by communities in the countryside, to boost the demand for their products," said FDCP president JC Buendia. Aside from his famous designs, JC is also best remembered as a contender in the GMA-7 show Celebrity Duets Season 2 which was won by former Metropolitan Manila Development Authority (MMDA) chairman Bayani Fernando in 2008. Nineteen finalists, who will compete in the apparel and accessories categories, will vie for the coveted prize package of a two-year scholarship at the School of Fashion and the Arts, a Php 200,000 allocation for business capital and more. Winners will be announced on November 22, 2011.